When the winter is over its peak, the beautiful snowdrops and Crocusses announce the approaching spring. They are the first flowers from a series of bulbous plants that will give your garden bright colors. Using the tips below will help you to have more fun from your flowerbulbs. Depending on the type of flowerbulbs you can plant in flower beds, borders or pots. Plant bulbs that preferably grow between trees or shrubs somewhere they can remain and multiply themselves. Hyacinths and tulips you put in groups between the perennials. In May or June you can beautifully plant the open spaces with one-year summer flowers. 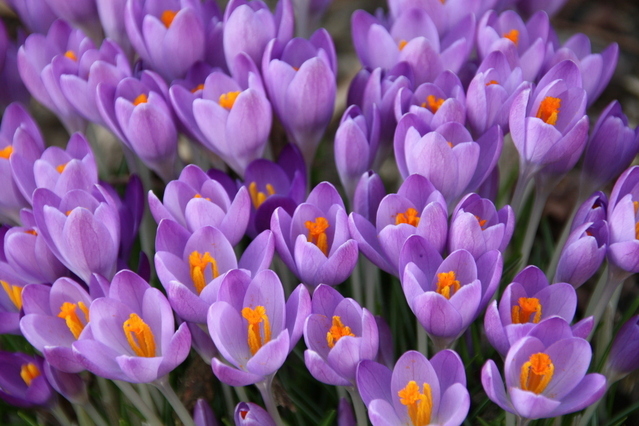 Flower bulbs are satisfied with every type of soil, as long as it is well-drained soil. Make heavy soil light-hearted with peatmoss or mix some compost through the ground. Flowerbulbs that bloom in spring, such as tulips, daffodils, hyacinths and crocusses, can be planted from mid-September to November/December. The species that thrive in the summer or autumn, such as Cannas, dahlias and lilies, are planted in spring. Bulbs are not planted very deep and this is described on the backside of the packing. As a rule, set the planthole depth equal to three times the maximum diameter of the bulb/tuber. However, there are so many exceptions to the rule that therefore prior to the planting check the information on the backside of the packing. Even if you don't have a garden, you can also enjoy early spring flowerbulbs. Plant the bulbs in pots.. In the garden flowerbulbs are often more beautiful in groups of one specie together, on a small balcony it may be real beautiful to plant various kinds to mix and enjoy in spring an exuberant display of colours. The months on the package of flowerbulbs are often indicated with Roman numbers. I = January, II = February, March= III, IV = April, V = May, VI= June, VII = July, VIII = August, IX = September, X = October, XI = November and XII = December.